November | 2018 | COMMUNITY ACTION ALLIANCE FOR NSW (CAAN): HOUSING INEQUALITY WITH AUSSIES LOCKED OUT! Even more sickening than the news article. One can almost envisage the smarmy look on the face. “those kids getting off the train every morning” … to buy homes for themselves … are Visa Workers! Next at the crux of this … the supply cannot meet the foreign housing demand from immigration and visa manipulation! No matter that “THE PUBLIC” want Labor to bring in “restrictive development policies” … fed up with the OVERDEVELOPMENT for foreign buyers! Next, what it omits to refer to is the NSW LNP bulldozing our rights by creating “complying development” and rezoning for higher density … the impact of which is revealed in our photo albums … the loss of amenity; there no longer is “any planning” … the market value of established homes is reduced by outsized and cheaply constructed new builds … isn’t that deliberate? Search CAAN Website for more about the Environmental Protection & Assessment Act (EP&A) and Independent Hearing and Assessment Panels (IHAPs) reforms; how they have been pulled apart! IT is up to each and everyone of us to ensure that the NSW LNP is not in office next year! Have you seen RE Agent For Sale signs on two adjoining properties inviting developers to buy both … in prep for Medium Density of 20 terraces in a low-rise garden estate? FIGHT BACK! The wealthy are looking after their patch … we can do the same … it’s about Community! PLEASE SHARE THIS WITH YOUR COMMUNITY AND FIGHT BACK! 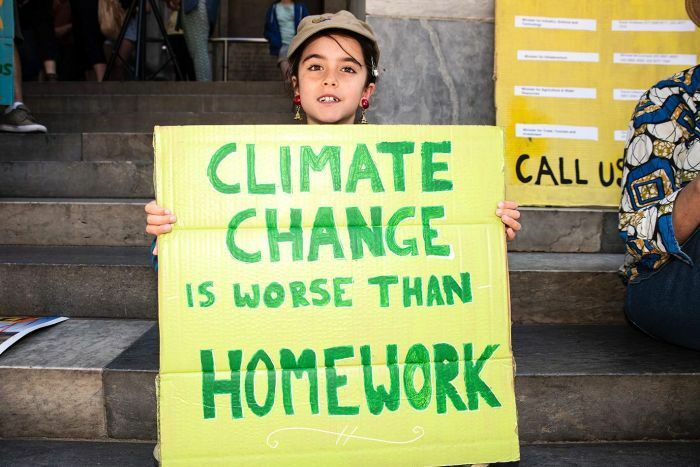 JUST LIKE OUR YOUTH ON CLIMATE CHANGE! It’s ironic to gather so many of this State’s leading builders and planners in a public space that wouldn’t pass muster under today’s building and planning regulations. Parliament House was a frontier surgeon’s quarters, which had two prefabricated halls shipped here from Scotland tacked on as parliamentary chambers. When the time came to build the tower block we’re sitting in to house the principal organs of Government, it had to be redesigned because the Council wouldn’t let us build any higher. This might actually be one of the last major functions the House hosts before we shut down for three months and complete the first major renovation of the place in 40 years. This building is a good metaphor for our planning system. An edifice steeped in tradition, adapted for a new use, with the component parts built on over time and as required. You could never knock it down and rebuild it, you can only make it work better. That’s been my focus in this portfolio for two years – making what we have work better and faster. I’m going to talk a lot today about public trust. Because so many of the issues that frustrate you, and the industry, and your stakeholders, come down to questions of trust. But before I do, I want to thank you, each and every one of you, because the building and construction industry in this State is responsible in so many ways for the economic transformation we’ve experienced since 2011. The achievements of my Government would not have been possible without your contribution. Because you are building them. The commitment and dedication of our residential building industry goes to the heart of our economic growth. All over the State, armies of young workers arrive in cities and towns every morning to work on the many construction and infrastructure projects we are undertaking as a government in partnership with the private sector. You can see them at Martin Place station in the morning at about 6am. You can see them at Parramatta. In the south west, in the north west. Across our city, every morning, thousands upon thousands of mostly young people, men and increasingly women, which can I say is fantastic, arriving to work on projects that were simply inconceivable a decade ago. The transformative impact of these jobs, these new jobs, simply cannot be understated. The economic impact is utterly profound. Every new pay cheque you’re cutting for a new worker on a new project is driving the success of our State to new heights. We are topping every economic indicator in NSW. And we owe it all to you. This decade, the industry has provided a generation of young Sydney siders opportunities in building and construction for the first time in a generation. This is driving our economy. Notwithstanding, I know there is growing anxiety about forward supply policies and population. I know if Labor gets in with their restrictive development policies times will get tough for everyone – builders, workers and importantly home owners. We owe it to those kids getting off trains every morning before the sun rises to get growth right. I’m going to tell some home truths today, and talk frankly about some of the concerns you have about my Government’s policies particularly around infrastructure contributions. But I want to make it absolutely clear what my agenda is from the outset. It’s those kids getting off the train to work in the morning. Those who have a once in a life time transformative opportunity to work, generate wealth for themselves and their families. We are committed. I am committed to growing their opportunity to work, to buy homes for themselves, to invest and to start families. This time last year, I would have been standing here talking about the public debate around housing affordability, and how we simply weren’t building enough houses to keep pace with growth. Today, we’re having a public debate about population growth, and how we are bringing more people here than our housing and infrastructure can keep pace with. Fundamentally, we are having the same debate. The same debate about growth. …has jumped to an admittedly logical conclusion that an alternative policy is to not have so many people to house, feed, move and keep safe. The same policy problem. Two very different solutions. I know this is the wrong crowd to convince on the merits of curbing population growth. You need consumers for your products and you need a workforce to build them. I know there are serious concerns in the business community about what slowing migration means for you. And their trust in civil society, and in business and political leadership to respond meaningfully, is at its lowest ebb. I’ve been making this point, since I was Resources and Energy Minister, and I’ve seen this scenario play out in those industries. When trust diminishes, when the public withdraws the social licence they give industries to operate, there are catastrophic consequences. We’re seeing it now with the banking royal commission, and the disgust the public are feeling with every new revelation. We don’t know what the long term impact of that will be but if past performance is an indicator, it will be problematic. But community anxiety about inappropriate development, about profiteering and past allegations of corrupt conduct and lobbying, could result in the social contract between your industry and the public being broken. The consequences of that for all of you, would quite frankly, be apocalyptic. We are barely keeping pace with population growth as it is. We cannot afford a downturn in supply. We cannot afford to not grow. We cannot afford to not build. You can’t. But it is impossible, utterly impossible, to build the apartments and houses of tomorrow if the public simply do not want them in their communities and towns. That message – born largely from a fear of change – is being delivered to this government on a daily basis – and the construction industry so far has been extraordinarily slow to react. So I say to everyone, it is our collective responsibility to create that trust with the public. And a lot of that responsibility does fall to you, the residential building industry. You are partners with the development sector. One can’t live without the other. If one lets the other down, there are problems for both. We need to start saying to our partners, to our stakeholders, at every opportunity – how are we convincing the public of the merits of these proposals? –millions of dollars collectively, to lobby myself, lobby my MPs, lobby councillors, lobby public servants, to get projects across the line –with no answer to the question of whether or not the public supports them. Before you knock on my door, I want you to knock on the doors of people in the neighbourhoods where you’re building. It’s one thing to convince a planning official or a councillor of the merit of a proposal. But if you haven’t convinced the family of four who have to look at what you’re building every day when they walk outside to pick up the paper and feed the dog, all the money in the world, all the glossy presentations, all the slickest lobbyists won’t save you. *You must first convince them of the merit of your proposals – increasingly they are becoming better organised, their voices are rightly getting louder and, importantly, across the political spectrum they are being heard. I go back to that point about trust. We in our sector, in the business of planning and housing, have a unique opportunity to build that trust now, and with it, build the cities and towns of tomorrow. Which excites me a great deal. Because I’m constantly staggered at the incredible quality of homes and apartments being built in this city today. And that’s a credit to all of you. To our architects and planners. The designs, the build quality, the construction techniques, every ounce of effort, going into building the homes for tomorrow’s Sydney is world class. What I see from angry communities is a cooling, a thaw if you will, in the hot tempers of activists the second the ribbon gets cut on new projects. Because there is a profound disconnect in the public mind, between what they think new buildings will look like and the impact they will have, versus the reality. I frequently use the example of Central Park in Sydney’s Broadway. A controversial project. There were protests in the street when the old brewery site was proposed to be knocked down. It is now a multi award winning work of public art. It is an incredible addition to our beautiful city. It is such a good looking building, it even manages to make the brutalist nightmare of the UTS site look attractive just by standing next to it! So it is possible to convince the public of the merits of major development. If the wealthy activists could change their mind after seeing Central Park completed, I have no doubt we can do the same to the people of Sydney, even in my own electorate of Lane Cove. Can I say clearly to you today, I stand by 100% all the supply side measures we initiated last year. We took on perhaps the greatest social and economic challenge in this country today, the challenge of increasing the affordability and accessibility of housing without diminishing the value of houses that so many Australians have invested their entire future in. I can read you a shopping list of achievements in planning from the last year, like the reforms to the EP&A Act and Independent Hearing and Assessment Panels. You know what we’ve done, you’ve given us feedback as well. We haven’t done everything you’d like either. I get that feedback loud and clear. There’s going to be plenty of time in the next 128 days before the NSW Election to tell you about achievements. You’re going to get them in your letterbox and on your TV screens daily, let me assure you. This is going to be one of the hardest state election campaigns in recent memory. But we stand by our record, and I think our record speaks for itself. The NSW Liberals & Nationals will still be in office next year, of that I can assure you. If the Commonwealth responds meaningfully to population growth, and with NSW having a seat at that table, we can take some of the pressure off our infrastructure. I think if the public sees meaningful action on population growth, it will ease some of the anxiety about inappropriate development and give your industry, and my portfolio, the breathing space it needs to get much needed supply into some crucial parts of our city as new infrastructure comes online. I know you have concerns about a cut in migration targets, just as you have concerns about taxes like stamp duty and infrastructure contributions. But something has to give. We are locked in an unsustainable cycle right now. I don’t think this gets reported enough about population growth, but it’s very important. In the matrix of factors we tabulate to arrive at our forward population projections, one is actually in deficit. Forward population is the sum of our birth rate, minus our death rate, plus overseas migration, plus interstate migration. But the column for interstate migration, is a minus. More people leave NSW for interstate, than arrive. A big factor there is affordability. Infrastructure. Liveability. I think it’s important for business to temper their panic about cutting migration with the fact that once strain on infrastructure decreases, the number of people leaving for other States will decline. We’re not going to wake up one morning and find the trains and roads empty like in a zombie movie. What will wake up to, is less playing catch up on infrastructure and better planning on where growth can be accommodated. We are doing so much great work on this right now but there’s more to do. We have a new regional plan for Sydney and 5 district plans already finalised by the Greater Sydney Commission. New land release areas announced in South East Wilton and South Creek West. We’ve approved plans for the regions because for all this talk about population, our regional towns are shrinking. And we’re fighting to address that and use regional migration to take the pressure off our cities. There are a lot of major issues facing your industry that State Government simply has no control over. One of those is accessibility to credit, it’s a problem for home buyers it’s a problem for you as well. I think the majority view, is that our supply side measures last year, coupled with macro economic measures implemented by the Commonwealth, had a real impact on affordability and are at least in part responsible for lowering house prices. But they won’t amount to much if home buyers can’t access credit. A one bedroom apartment at 40 square metres for $400,000 is completely out of reach to a first home buyer if the banks will not lend at all to anything below 50. That last point is a particular concern to me as I think we were on the right path last year with changes to SEPP 65 around minimum lot sizes. I continue to be passionate about making sure there is diversity in housing stock. I know a lot of you were very great supporters of my Medium Density Housing Code changes. I am a great supporter of my Medium Density Housing Code Changes too! But it goes back to that point I made up front about bringing the public with us. Now there was a lot of politics involved with the Medium Density Code. We might see some warming up to the idea when there’s no margin in putting out glossy pamphlets criticising it. I think that’s something we have to revisit aggressively next year. Medium density unlocks so much potential. It unlocks suburbs that were previously out of reach to first home buyers, in unlocks the wealth generating potential in land already owned. It also enables diversity in housing – providing young people with access to the types of homes they need in their early stages of life in the areas they want to live – and also allowing older people – so called “empty nesters” – to stay in their communities. It can and will be transformative, but I’m the first to admit we have a lot more work to do convincing councils and the broader community. Finally, I want to turn to infrastructure contributions. I want to work with you on infrastructure levies. I came to this job and I wasn’t happy about them either. I take you right back to my point about the planning system – an ancient edifice with parts glued on as required. It works, but it also gets clumsy. And I think years of tinkering with infrastructure contributions has made our system very clumsy. I absolutely stand by our State Infrastructure Contributions. Because I know the State Government is capable of efficiently distributing those funds where they’re needed. I’m out every day of the week at the moment either announcing or cutting the ribbon on another project bank rolled by those contributions. I can see they’re working, I think the community can see they’re working. In fact, in my view, they are a vital part of ensuring community support for development….they are an important tool in addressing community concerns around development. With regard to section 94s, I appreciate your concerns. But I think it would be helpful going forward if you started seeing State Government as an arbiter between yourselves and council on reform in that space, and not another bad guy. And let me make this absolutely clear – I want to reform infrastructure contributions. It’s been my long ambition, since coming to this job, to create a system that sees you cutting just a single check for all the required infrastructure supporting your projects up front, in a transparent way. That’s going to be a priority next year. An absolute priority. And it’s going to mean some frank and fearless discussions with councils that I will need your support on. But any discussion on contributions has to be predicated on this basis – they are absolutely vital. I take you right back to that point about public trust. There will be no sympathy for any industry trying to dodge their civic responsibility to pay for public infrastructure that supports their profit making enterprises. And I actually see your industry responding to that challenge. I’ve never spoken to a developer or builder who didn’t want to contribute in a meaningful way. I think the principal problem we have to address is ensuring you know up front what you’re paying for, how much, and why we need it. And that’s something that’s going to take a lot of work to get right and I look forward to going on that journey with you in the new year. Can I say in conclusion, with so many analysts predicting a rocky path ahead as the market cools, I appreciate there is much anxiety. But can I say, the best thing about market cycles is they’re cycles, and we’ve been through downturns before and Government has responded. One response from the past was the creation of Landcom, to unlock more land at lower prices and get projects moving when times were tough. I think one of our most important reforms in the last two years was getting Landcom back as its own operation, with it’s own specific mission, away from the broader infrastructure delivery of platform of Urban Growth. Can I just congratulate John Brogden for all the work he’s doing there and say to you all, we are in safe hands, Landcom represents such an important safety net for the market I think whatever happens in the coming years, you’ll see NSW continue to outperform other jurisdictions because we are pre prepared with a Government response to whatever market failures may or may not occur in a constrained economic environment. New research has revealed one of Australia’s most iconic animals, the platypus, faces a bleak future with declining numbers prompting academics to call for their protection status to be upgraded. 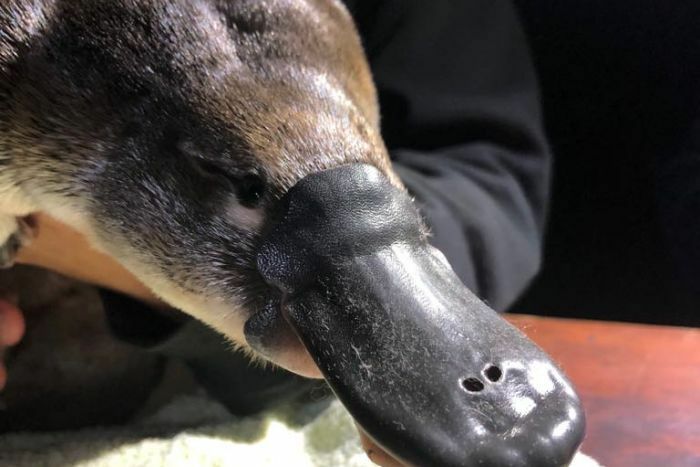 Scientists at the University of NSW said the number of platypuses in Australia has dropped by a third in the past 200 years. 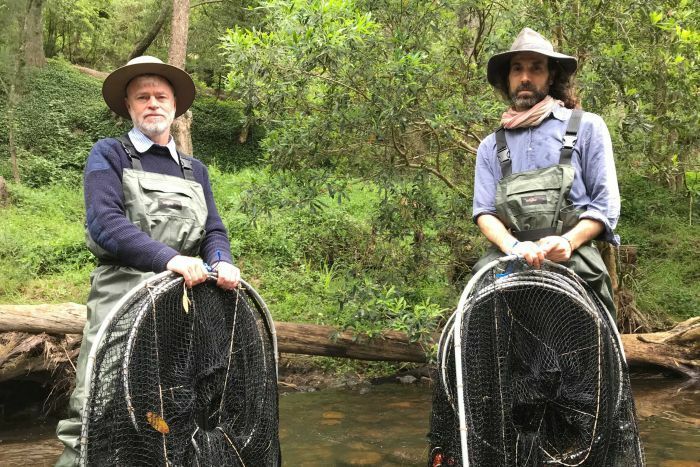 The team working on the Australian Research Council project spent 200 nights examining 300 kilometres of eastern Australian rivers from Queensland to Tasmania. Professor Richard Kingsford, who led the project, described the results as “worrying”. “We’ve gone from probably 300,000 to around 200,000 which is a 30 per cent drop [and] very worrying in 200 years,” he said. The scientists claimed platypus habitats have been destroyed by land clearing, pollution and dam building. They said the species’ declining population was also being affected, as platypuses can get caught in yabbie traps. The scientists have now demanded the “Opera House” yabbie trap be outlawed. 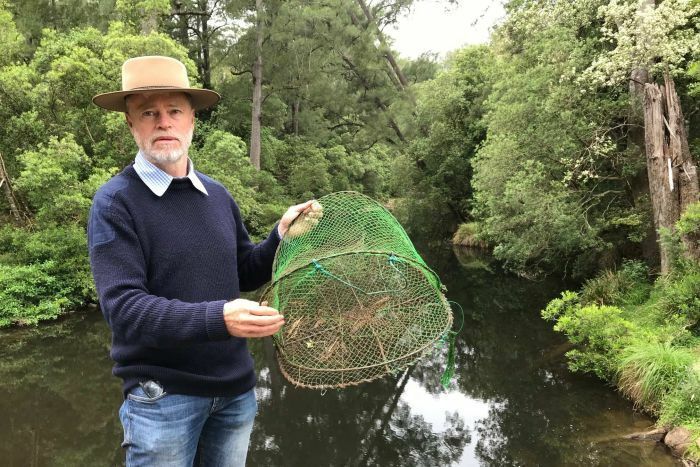 “Essentially they’re a trap that sits on the bottom of the river, they attract yabbies which also platypus love, so they’ll go in after them and they can’t get out … they drown,” Professor Kingsford said. The researches are calling platypuses’ protection status to be elevated from near-threatened to vulnerable. The NSW Government is now considering whether to phase out yabbie traps and is in discussion with stakeholders. But on the Kangaroo River in the Illawarra, the results are not as bleak. The last three years in this area have been promising and only minutes after they have laid their first trap a ripple alerts them to a platypus in the net. The healthy female is put in a pillow case to replicate the burrow before it is taken away to a platypus field hospital for processing. There the animals are anaesthetised while genetic testing is done, fur samples are taken and even their diet is analysed. 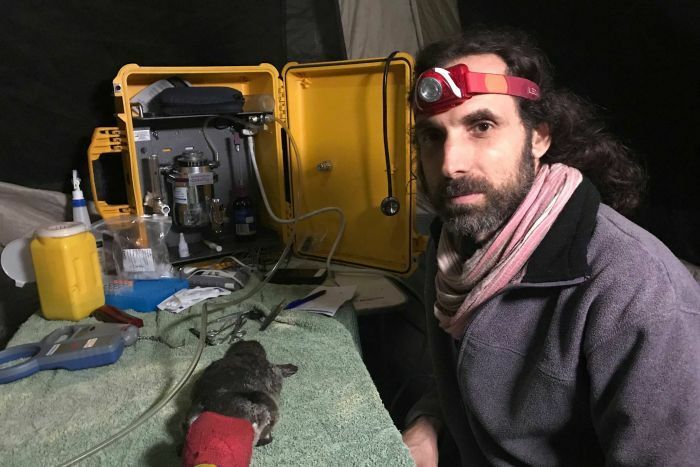 “We put them to sleep and we take measurements and tag them to better understand their health and get a bit more understanding about the demographics,” Dr Gilad Bino said. As the team wrap up their surveys on the Kangaroo River in the small hours of the morning, they are buoyed by the good results — they have caught four platypus in just over two hours showing a healthy river system. Researchers said it was catching platypuses that made the long hours worth it. 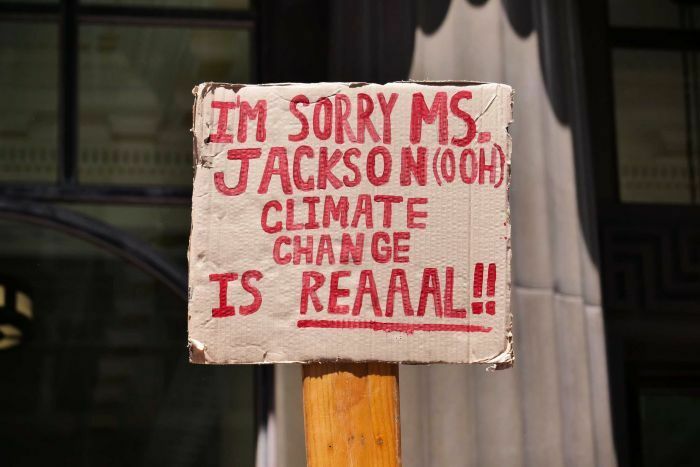 RELATED STORY: Kids are skipping school today to go to a climate change protest — should you let them? 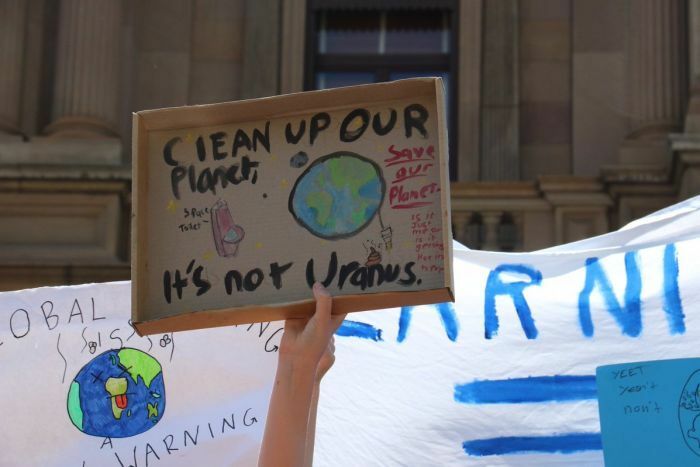 It follows similar protests in Canberra and Hobart earlier this week, which have spurred on the junior activists. Should kids be part of political protests? 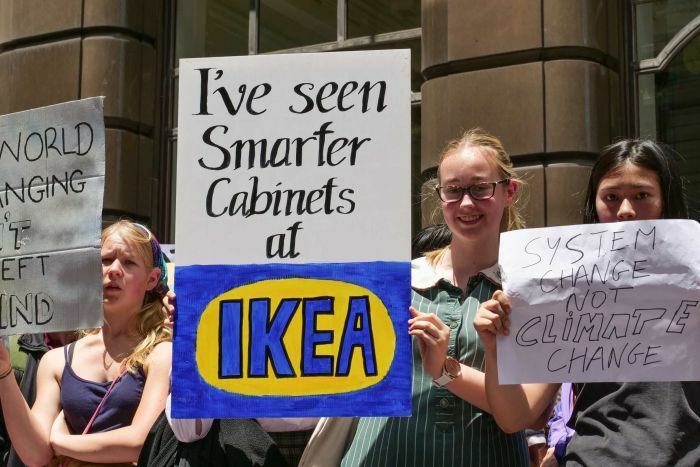 The PM wants “less activism” in schools, but experts say it’s all part of a “civics education”. News of her one-woman vigil caught the attention of Harriet O’Shea Carre and Milou Albrecht, both 14. 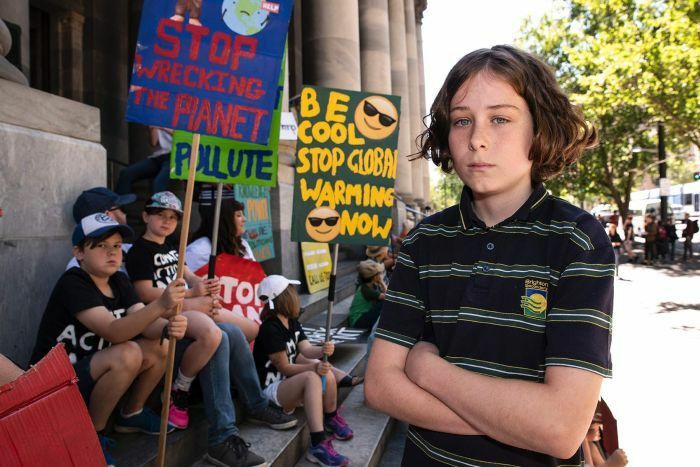 The pair, from the Castlemaine Steiner School, and a group of other climate-concerned teens travelled to the nearby regional city of Bendigo, about 90 minutes from Melbourne, to hold their own protest outside the office of Nationals senator Bridget McKenzie. That in turn sparked today’s protests across the nation. 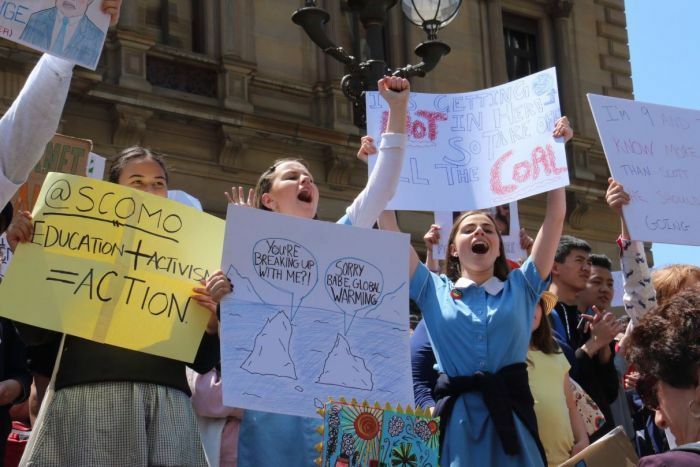 “We have to sacrifice our education, which is something we really value, so we’re showing them that at the moment this is even more important than our education,” Harriet O’Shea Carre said. 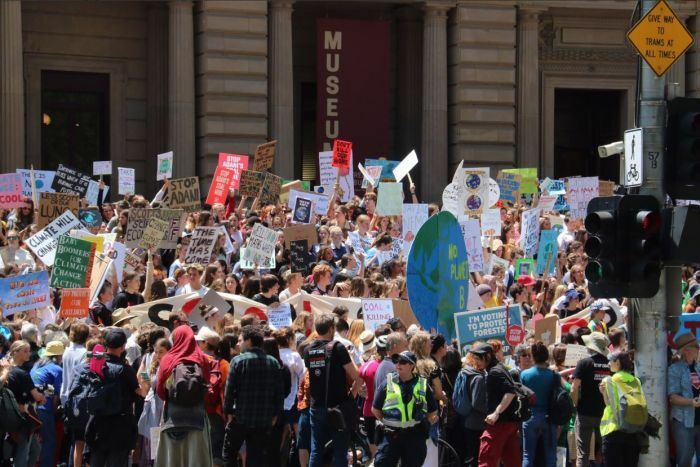 Earlier this week Prime Minister Scott Morrison revealed he was also not impressed with students taking time off to protest. “We don’t support the idea of kids not going to school to participate in things that can be dealt with outside of school,” he said. 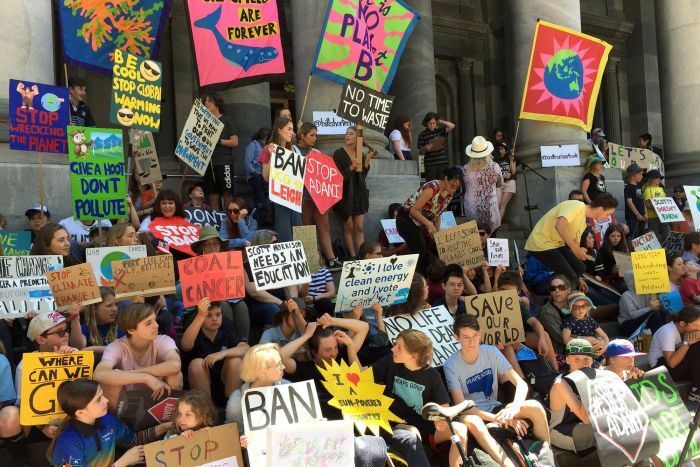 In Adelaide, about 300 students rallied at South Australia’s Parliament House, forcing police to block off a lane of traffic on North Terrace as another 200 onlookers spilled onto the road. Year eight student Zel Whiting also took aim at the Prime Minister. He said he was increasingly frustrated with the Government and its “lack of awareness or activity on climate change and its dangers”. “Mr Morrison says schools are not parliament,” he said. “Mr Morrison, take a seat. You are about to be schooled. “If everybody can contribute minor things that help the environment, such as using less plastics and not leaving your lights on — very small things — if everybody in Australia did that, we could really make a difference,” he said. Reports other than this one reveal there are 2.2 Million Visa holders currently in Australia of which 1.6 Million are Visa Workers … this is not sustainable … note that which we have highlighted in this article! *Locked away in chapters 13 and 14 are incendiary analyses on the great Australian migrant wage rort, which is unambiguously lowering employment standards and undercutting local workers. Three main facts about their presence in Australia are relevant to the discussion of wage stagnation. First, there are large numbers of TMWs in Australia, currently around 1.2 million persons. Second, those numbers have increased strongly over the past 15 years. One link to slow wages growth, as highlighted by orthodox economics, stems from the simple fact of increased numbers, which add to labour supply and thereby help to moderate wages growth. This chapter argues, however, that the more salient point concerns the way many TMWs are mistreated within the workplace in industry sectors such as food services, horticulture, construction, personal services and cleaning. *Official stock data indicate that the visa programmes for international students, temporary skilled workers and working holiday makers have tripled in numbers since the late 1990s… In all, the total number of TMWs in Australia is around 1.2 million persons. *Decisions by the federal Coalition government under John Howard to introduce easier pathways to permanent residency for temporary visa holders, especially international students and temporary skilled workers, gave a major impetus to TMW visa programmes. *Most international students and temporary skilled workers, together with many working holiday makers, see themselves as involved in a project of ‘staggered’ or ‘multi-step’ migration, whereby they hope to leap from their present status into a more long-term visa status, ideally permanent residency. *Though standard accounts describe Australian immigration as oriented to skilled labour, this characterisation stands at odds with the abundant evidence on expanding temporary migration and the character of TMW jobs. A focus on raw numbers of TMWs may miss the main link to slow wages growth. It is the third point concerning underpayments and predatory business models that seems richest in implications. This point suggests, first and most obviously, added drag on wages growth in sectors where such underpayments and predatory business models have become embedded. *In this chapter we explore a largely untold story in relation to temporary migrant workers… it exposes a very real wages crisis facing workers on the Temporary Skill Shortage (TSS) visa (formerly the 457 visa) in Australia. 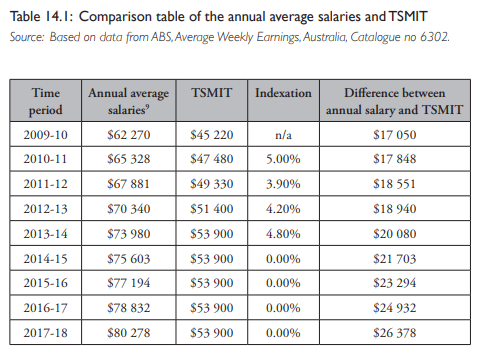 In Australia, these workers are employed via the TSS visa and they must be paid no less than a salary floor. This salary floor is called the Temporary Skilled Migration Income Threshold (TSMIT). *There is now a gap of more than A$26 000 between the salary floor for temporary skilled migrant workers and annual average salaries for Australian workers. This means that the TSS visa can increasingly be used to employ temporary migrant workers in occupations that attract a far lower salary than that earned by the average Australian worker. 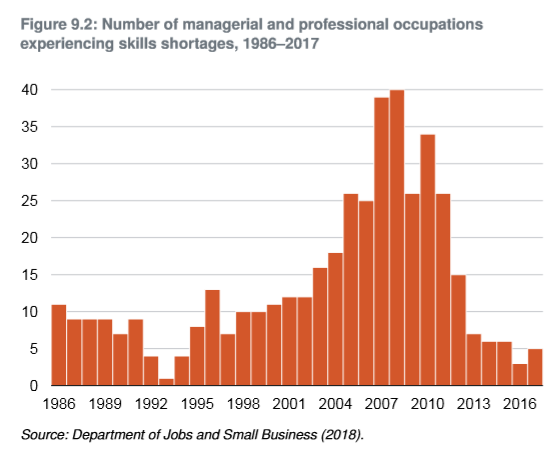 *This begs the question — is the erosion of TSMIT allowing the TSS visa to morph into a general labour supply visa rather than a visa restricted to filling labour market gaps in skilled, high-wage occupations?.. *The simplistic notion that employers will only go to the trouble and expense of making a TSS visa application when they want to meet a skill shortage skims over a range of motives an employer may have for using the TSS visa. These could be a reluctance to invest in training for existing or prospective staff, or a desire to move towards a deunionised workforce. Put simply, temporary demand for migrant workers often creates a permanent need for them in the labour market. A national survey of temporary migrant workers found that 24% of 457 visa holders who responded to the survey were paid less than A$18 an hour. Not only are these workers not being paid in according with TSMIT, but they are also receiving less than the minimum wage. Therefore, if Australia was to remove the carrot of permanent residency by slashing the intake, it would also automatically reduce the flow of temporary migrants, since the two areas are intrinsically linked. In turn, workers’ bargaining power would be increased. Elderly grandmas are being used as fronts for illegal residential real estate purchases by foreign investors, the Australian Tax Office has told a parliamentary inquiry. Not one person has been prosecuted by the ATO for breaching laws governing foreign investment in residential real estate, the ATO told the Joint Committee of Public Accounts and Audit on Wednesday. ATO deputy commissioner Mark Konza described the “difficulties” in pursuing criminal convictions by pointing to the case of an elderly woman suspected of being a “front person” for a foreign property investor. “We looked at prosecuting that person but they turned out to be someone of limited education, limited language skills, advanced age and other sympathetic factors,” Mr Konza told the committee. Committee deputy chair and Labor MP Julian Hill told The New Dailythat the government has not done enough to crack down on illegal investment in real estate, a “perennial” issue for the community. It’s difficult to accept that the best the government’s done is not to prosecute one grandma,” Mr Hill said. At Wednesday’s hearing, Mr Hill lambasted the tax office for displaying a “lack of curiosity” towards investigating breaches of Australia’s foreign real estate investment laws by “dodgy” investors. “This is an enormously important issue for community confidence in foreign investment,” Mr Hill said. There is a lack of community confidence that “the rules are [being] applied fairly”, according to Mr Hill. “In Melbourne there’s the sense that a whole number of purchasers are just dodgy,” he said. Foreign investors from around the globe pump billions of dollars into Australian residential real estate each year, and are largely restricted to new builds and developments that add to the existing housing stock. The real estate investment boom peaked in 2015-16 with 40,149 real estate approvals for foreign investors worth a total of $72.4 billion, according to the Foreign Investment Review Board (FIRB). That slumped to 13,198 approvals and $25.2 billion in 2016-17. The government’s policy for foreign investment in residential property is to “channel foreign investment into new dwellings to support additional jobs in the construction industry as well as economic growth”, according to the FIRB. Treasury tasked the tax office with overseeing compliance with foreign investment in real estate laws in 2015. Mr Konza defended the ATO’s track record in Wednesday’s hearing, telling the committee that the agency has overseen “a significant crackdown on non-compliance”. The agency has completed 3940 investigations and identified 1158 breaches, resulting in 1067 financial penalties totalling $5.5 million since 2015. The average fine for a foreign buyer found to be in breach of Australia’s real estate investment laws is just over $5000, the ATO admitted. The ATO’s investigations have resulted in the forced disposal of 231 foreign-owned properties, valued at $284.9 million. However, buyers forced to sell illegally purchased properties are still able to benefit from any capital gains that may have accrued, the committee heard. The committee’s hearing – the second of three – follows a report by the Australian National Audit Office (ANAO) released in June which raised issues about the ATO and Treasury’s “management of compliance with foreign investment obligations for residential real estate”. “The key challenge for the ATO going forward will be addressing the more serious instances of non-compliance with the foreign investment framework; namely, demonstrating wilful non-compliance with obligations and applying criminal and civil penalties,” the report said. At the time of the audit, the ATO was unable to estimate the magnitude of non-compliance. On Wednesday, Mr Konza told the committee that the ATO is still unable to put “a firm time” on when it will be able to work out “the underlying level of non-compliance”. The ATO was also tasked with compiling a national register of residential real estate purchases by foreign investors. The organisation relies on “sophisticated data-matching capability combined with other sources of intelligence, including community referrals” to “detect and investigate any instances of potential non-compliance”, it said in a submission to the committee. In June, the ANAO identified “serious deficiencies” in “populating the register with reliable data”. The report cited a “likely under-reporting of self-registrations, over-reporting of foreign identity information in state property data, and low levels of matching between datasets for foreign investment applications, self-registrations of foreign investment in residential property and state property data”. The ATO admitted during Wednesday’s hearing that it is not on track to finish compiling the national land register by the end of the year. The committee’s final public hearing on the issue takes place on December 5. EPPING WEST PUBLIC: School of Hard Knocks: Playground injuries due to crowding! COMMUNITY ACTION ALLIANCE FOR NSW (CAAN) … recently gave you a photo tour of a follow-up Visit to Epping with more High-Rise developments and lots cleared for more! Poor little children … what will Mirvac, Poly, Meriton, LendLease, Crown et al do about this? If it were not for NSW INC, the Property Sector and Lobbyists … how much “better” it would be! This is sadly not confined to Epping … it’s happening in nearby Meadowbank, West Ryde, Ryde, Lane Cove … in fact wherever higher density is happening! COMMUNITY FEARS about overdevelopment it turns out are well-founded with car parking at a premium with limited times, parking fees and fines, trains and buses are full-up, roads are grinding to a halt! Where we live is being annihilated as “The Mob” flog off their dwellings with our Families locked out! Pupils are being injured in crammed playgrounds at Epping West Public as the “well over capacity” school squeezes in more demountables to cope with the influx of enrolments. Parents fear the wellbeing of their children will suffer as enrolments are set to hit nearly 1300 next year — 500 above what is considered a “reasonable” learning environment for a public school, Epping West P and C president Ben Yee says. “When it is at this overcrowding level, a lot of things suffer including students becoming just a number,” said Mr Yee, who revealed there would be 27 demountables by term one next year. One of the staggering number of demountables at Epping West Public. Parent Natalie Ng said her son, Jake, 7, was “badly hurt” in the playground, which was shrinking to make way for the extra demountables, last week. “He was hit in the head by a flying ball because all the kids are playing in such a small space,” she said. “He complains all the time about having nowhere to run around. Kendall Mathews, 6, and fellow students and parents protest over the increasing number of demountables popping up at their school at Epping West. The school is expected to have 12 kindergarten classes in 2019. Ms Ng’s five-year-old twins, Liam and Lucas, will be among the big intake. “I worry about my twins and what the school’s going to look like by the time they are in Year 6,” she said. Labor candidate for Epping Alan Mascarenhas said Epping West Public had “well and truly outgrown its original purpose”. Fighting for kids’ better learning conditions: Parent Natalie Ng, ALP state candidate for Epping Alan Mascarenhas and parent Felicity McCann at Epping West Public this week. “The 27 demountables taking over the school oval is just out of control,” he said. “Whether it takes a day, week or a month, we’ll force the government to upgrade this school. Epping state Liberal MP Damien Tudehope said negotiations were under way for a new primary school at a disused TAFE site in Chelmsford Ave.
“Epping West Primary and Eastwood Public are taking up a lot of the burden of development in this area,” he said. A NSW Education Department spokesman said there were 12 major school building projects under way “in the vicinity” of Epping West Public. Another believes the government should block the Adani coal mine and transition to 100 per cent renewable energy. He delivered a harsh assessment of Australia’s federal politicians. “There’s too much arguing over their own power, and they’re not representing the people any more,” he said. THEY DON’T WANT TO SIT AROUND WAITING UNTIL THEY CAN VOTE! 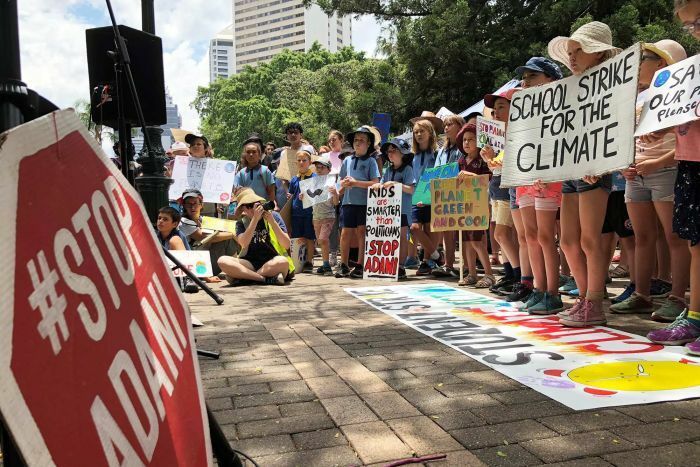 Thousands of Sydney students have defied the Prime Minister’s instruction to stay in the classroom by going on strike to protest against the federal government’s climate change policies. Thirty major strike events took place around the country, organisers said, as students united with a common goal. 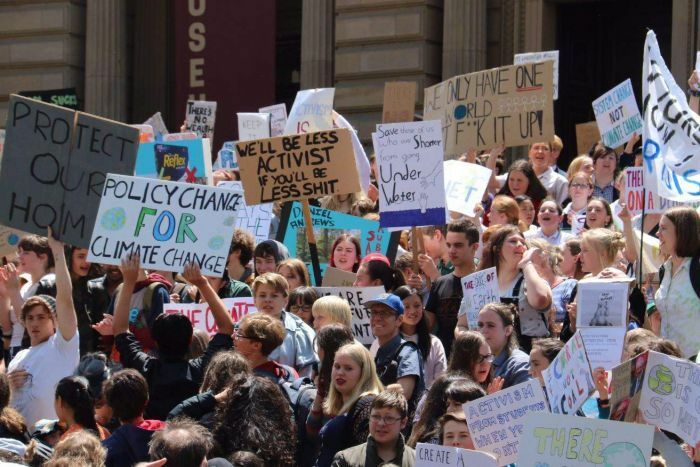 Students gathered from 11am in Martin Place in Sydney’s CBD, with loud cheers and chanting whenever a new group arrived. Organisers estimated the crowd at 5000. A smattering of police officers gathered on the fringes. One was overheard to express his disgust at the idea of skipping school to attend a rally. The crowd packed in to the Martin Place amphitheatre, right outside the Tesla showroom. “What do we want? Climate action. When do we want it? Now,” one chant went. 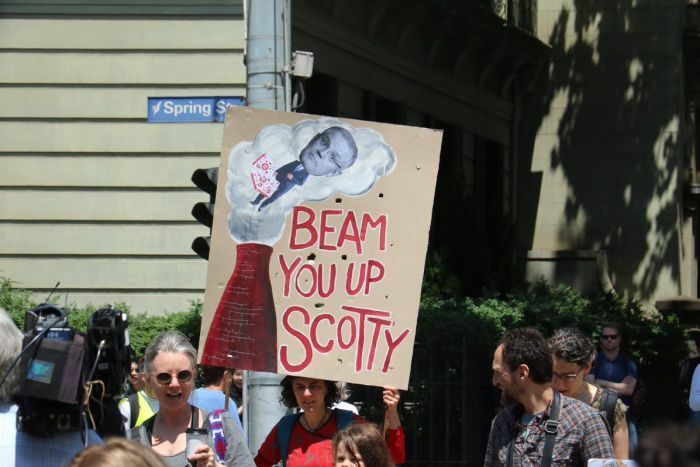 “Hey hey, ho ho, ScoMo has got to go,” was another chant, referring to Prime Minister Scott Morrison, who, this week, condemned the proposed strike. The NSW Education Department threatened that public school students could face disciplinary action. Thousands of students walked out of schools across the country to demand more action on climate change from the federal government. “Any student not in classes on a school day will be marked absent and may be subject to the school’s disciplinary code,” a spokesperson said. Nosrat Fareha from Auburn Girls High School was one of the speakers addressing the huge crowd. “We have a voice and we will use that voice to demand better from our leaders,” she said. Pat Langford, 18, has just finished year 12 at Oakhill College in Castle Hill. He believes the government should block the Adani coal mine and transition to 100 per cent renewable energy. Michelle Walker is a teacher at Kinma school in Terrey Hills, on Sydney’s northern beaches. With parental consent, she brought a group of 19 students in years 4-6 to the event. She said her students were looking at ways to reduce plastic, and were actively involved in making a practical difference. “We just recently went down along the beach at Mona Vale and collected as much plastic as we could,” she said. 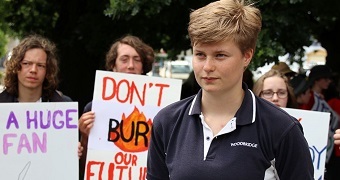 Jean Hinchliffe, 14, is a student at Fort Street High in Petersham. 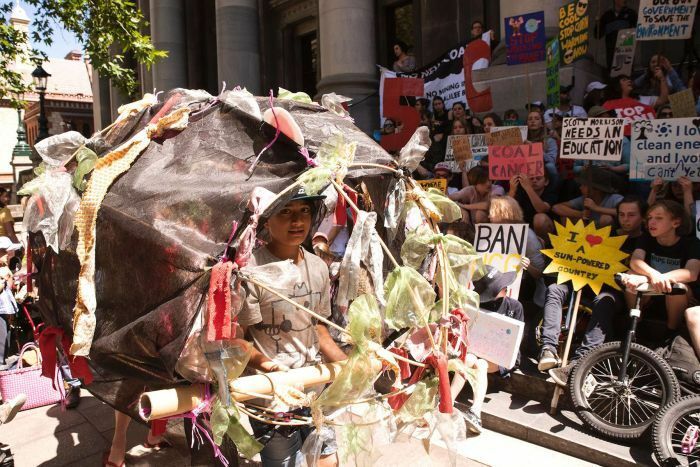 She said she was striking “to tell our politicians to stop all new coal and gas projects, including Adani’s mine, and take immediate action to move Australia to 100 per cent renewable energy”. Ella, 10, said she aspired to be “someone with a voice that can change things”. Peakhurst resident Gary Volk, who was passing by, expressed scepticism about the students’ motives. “Boys and girls, they join to be together, it doesn’t matter what. I am against these type of activities,” Mr Volk said. He was also doubtful about human ability to repair the damage already done. When the peaceful protest ended after about an hour and 40 minutes, no trace of rubbish was left behind. WESTERN SYDNEY AIRPORT has commissioned design firm Architectus to develop a masterplan for the 191-hectare business park, located in the growing investment region known as Western Sydney’s “economic zone”. Feature Image: The Vision for Western Sydney Airport. 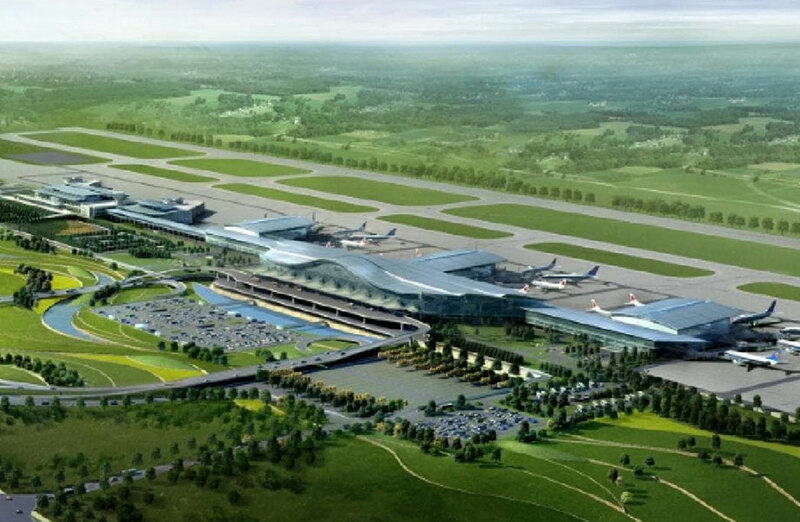 Up to 10-million annual passengers are expected to visit the airport site which will comprise office, retail, industrial, hotels and conference facilities. Australian firm Architectus won the contract after a procurement process undertaken by Western Sydney Airport (WSA). WSA chief executive Graham Millett said the significant land parcel is located on prime airport real estate. Master planning for the Airport’s business park is anticipated to be complete by mid-2019, with an opening date slated prior to the airport’s operational date in 2026. 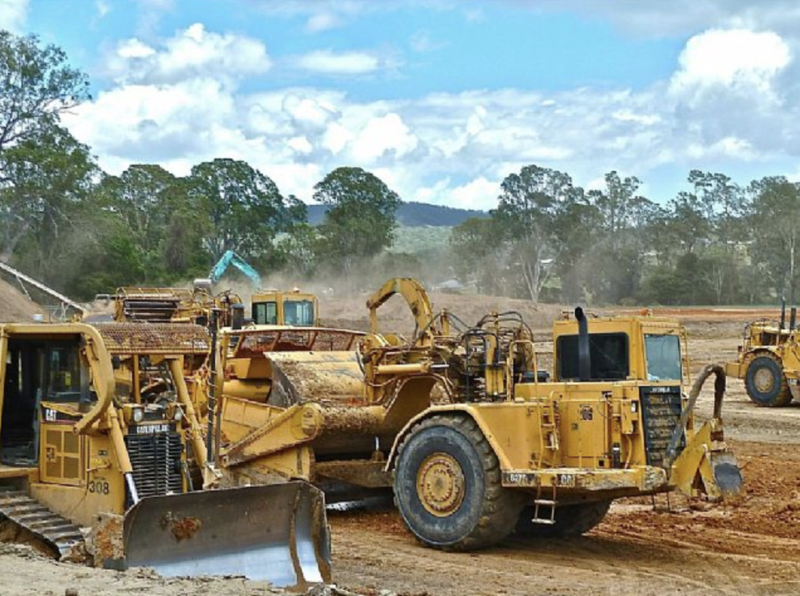 Earthworks commenced for Western Sydney Airport in September. Nearby, construction of the Western Sydney airport is underway on the 1780 hectare site, with initial earthworks kicking off in September. British firm Arup Group won the contract to develop the masterplan for Western Sydney’s $5.3 billion airport. Federal, state and local governments announced earlier this year it would invest $20 billion into the new airport city in Badgerys Creek, fast-tracking infrastructure for the precinct touted as the state’s “newest economic zone”. The airport has been described as “a transformational infrastructure project” that will generate economic activity in the region. The Australian Government is investing up to $5.3 billion in equity to deliver the airport through the government-owned company, ‘Western Sydney Airport’. HOUSING MINISTER warns of catastrophe if public loses faith in Developers! How arrogant can you be? A Report in “The Fifth Estate” concerning the Planning Minister revealed that over 9 months in 2017 he met with 53 developer groups and not a single resident … how can there be a “social contract”? DESPITE widespread community outrage over the medium-density housing code the sinister solution is to reform developer contributions for community infrastructure that would not be needed if it were not for the foreign invasion with “our families” locked out! SEARCH for CAAN articles on the “Good Growth Alliance” of developers and charities! NSW Planning Minister Anthony Roberts has warned the housing development industry it risks losing its “social licence” to operate if it does not do more to restore trust with the public. Mr Roberts told a lunch hosted by the Housing Industry Association on Wednesday that the industry needed to confront public scepticism if it were to be able to build the “houses and towns” of tomorrow. In making this argument, Mr Roberts tried to reconcile the government’s position last year – that it needed to increase housing supply to reduce pressure on prices – with its current position – that a migration slowdown is needed. *”Whereas last year, we said quite clearly and plainly that the only meaningful housing affordability measure was to increase supply, the public debate, the political debate, has jumped to an admittedly logical conclusion that an alternative policy is to not have so many people to house, feed, move and keep safe,” Mr Roberts said. CAAN: Despite the huge increase in supply it could not meet the foreign demand and dwelling prices skyrocketed. CAAN Photos: 1. Lachlan’s Line by Chinese real estate group Greenland at Macquarie Park; 2.Lachlan’s Line towers over North Ryde village; 3. Herring Road Macquarie Park Precinct; these towers will soon lose their views with the Neue development to be constructed on the opposite side of Herring Road. He said the reason that debate had shifted was that trust in business and political leadership to respond to concerns about development had fallen to a low ebb. “When trust diminishes, when the public withdraws the social licence they give industries to operate, there are catastrophic consequences,” he said. The development industry had not lost its social licence, he said, but “community anxiety about inappropriate development, about profiteering and past allegations of corrupt conduct and lobbying, could result in the social contract between your industry and the public being broken”. the public simply do not want them in their communities and towns. Rather than spending money on lobbyists, he said, developers and builders would be better served consulting their communities to attain support for their projects. Often, he said, members of the public would end up supporting projects they previously opposed in theory. The minister also said he still supported the medium-density housing code, which has been frozen for a year. And he said that he intended to reform contributions levied on developers for community infrastructure, which they needed to pay, but which should be simpler. After the speech, the Department of Planning uploaded a precis to its website that was more confrontational in tone than that delivered by the minister. Responding to that precis, Steve Mann, the chief executive officer of the Urban Development Institute of Australia, said there had been a “move towards increasing taxes and charges on new homes”. “We take our industry’s social licence to operate and grow Sydney well very seriously,” Ms Fitzgerald said.